THE ROCKY MOUNTAINS are a chain of mountain ranges 3,000 mi (4,800 km) long and as wide as 350 mi (563 km) running predominantly north to south in the western part of the North American continent. The Rockies run through the U.S. states of NEW MEXICO, COLORADO, UTAH, WYOMING, IDAHO, MONTANA and ALASKA, as well as the Canadian provinces of Alberta and British Columbia and the Yukon and Northwest Territories. They have been described poetically as the continent’s spine. The Rockies were originally formed approximately 100 million years ago, during the Cretaceous period, when dinosaurs still walked the Earth. There was a second period of uplift within the past 25 million years, and Pleistocene glaciers further reshaped many of the major valleys, widening and rounding their bottoms. Some small glaciers have survived high in the northern Rockies, remnants of the great Ice Age. The best known may be found in Glacier National Park in Montana on the Canadian border. Recently there has been concern that global warming is causing these glaciers to shrink and some of the smaller mountain glaciers may disappear altogether. The Rocky Mountains are rich in wildlife to match the rugged scenery. Piñon pine and juniper are common in the southern Rockies, while they give way to firs, pines, and spruces further north. Beyond the timber line (the altitude above which trees cannot grow), mountain goats and bighorn sheep browse in alpine meadows. The forests downslope are home to bears, deer, elk, hares, minks, cougars, porcupines, squirrels, and other woodland creatures. The rivers of the region are rich with fish such as rainbow trout and grayling. Within the Rocky Mountains lies the Continental Divide, which separates the waters that flow to the PACIFIC OCEAN from those which will flow into the ATLANTIC. The Rocky Mountains contain the headwaters of such rivers as the Arkansas and Missouri (tributaries of the MISSISSIPPI), the RIO GRANDE (which forms the border between TEXAS and MEXICO), the Colorado (which formed the GRAND CANYON and ultimately flows into the Gulf of Cortez) and the Columbia (principal river of the U.S. northwest). The most famous mountain of the Rockies is Pikes Peak in Colorado, which is 14,110 ft (4,301 m) tall. Another notable mountain in the range is Cheyenne Mountain, which houses the underground command center for NORAD (the North American Aerospace Defense Command). That complex was constructed by blasting an enormous artificial cave out of the rock of the mountain and was intended to survive a direct attack by Soviet nuclear missiles. However, most activity in the Rocky Mountains is of a more peaceful nature. Historically, mining has been the chief industry in the Rockies. The mountains contain a wealth of minerals, including gold, lead, molybdenum, silver, zinc and soda ash. Fossil fuels such as coal, petroleum, and natural gas to fuel hungry lowland industries have also been a valuable source of wealth. Lumbering has been an important economic activity, although timber companies have moved from clear-cutting of natural growth to the managed harvesting of planted stands, making it more akin to agriculture than mining. Agriculture in the Rockies is primarily regulated by the availability of water. Although the use of irrigation has changed the established patterns of agriculture by making water available where it was previously scarce, it has brought other problems, including water table depletion and soil salination. Herding has been the primary form of agriculture in the high mountains, with cattle and sheep being moved between upper and lower pastures according to the seasons. Because sheep can graze far closer to the ground than cattle, there have been frequent conflicts between shepherds and cattle ranchers, who accuse sheep of destroying the range. These problems have been exacerbated in the UNITED STATES by federal government policies that permitted herders to rent federal lands for grazing at prices far below the market value of the land. In the foothills farmers raise crops that work well in small plots, especially vegetables and chili peppers. 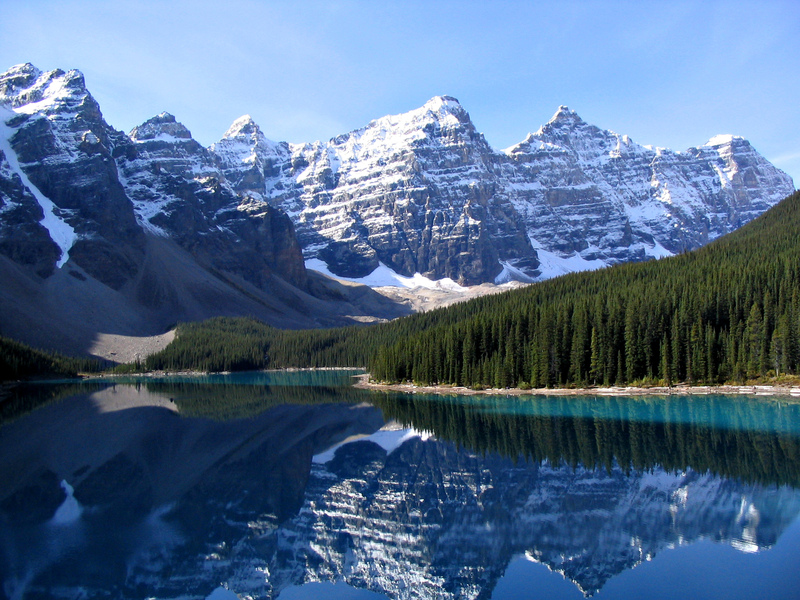 The picturesque scenery of the Rockies make them a popular tourist destination. Yellowstone National Park, an enormous caldera volcano slumbering in the Wyoming Rockies, is famous for its hot springs and geysers as well as its abundant wildlife. The rugged mountains also make for excellent ski slopes. Wellknown ski resorts in the Rockies include Vail and Aspen, Colorado; Taos, New Mexico; and Jackson Hole, Wyoming. The abundance of wildlife draws hunters and sports fishermen. However, the growth of the tourist industry has not been without its problems. In addition to the obvious problems of environmental degradation, developments adjacent to wilderness have brought increasing conflicts with humans and wildlife. Almost invariably wildlife is the loser in the encounter, particularly when the association has led to an erosion of wild creatures’ fear of humanity. Bears, cougars, and other predators come wandering through suburban developments, attacking pets and even their masters, leading to the destruction of the predator as a threat. Deer and elk crossing the highways become increasingly likely to be struck and killed by traffic, although passengers in smaller cars are also apt to suffer injuries or even death.